How Far Will Global Temperature Drop After El Nino? After the recent intense El Nino peaked between January – April global monthly temperatures this year have been declining. Although they remain high they are expected to decline further as the El Nino effect finally recedes. One important factor frequently missing in reports is that El Nino is a short-term event – weather not climate. Even the Met Office is a little confused when it comes to short-term and long-term effects.They call the El Nino a naturally-occurring climatic event, adding that it is the dominant factor of climate variability on interannual timescales. This is a contradiction as climate is, of course, measured over a much longer period than individual El Ninos. Indeed, the rapid rise and fall of the El Nino seen in the recent temperature spike is much too fast to be a climatic phenomenon. With 2016 being predicted as a record warm year it is interesting to speculate on what the El Nino’s contribution will be, which is, in a word, everything. It can be argued that without the El Nino (and the so-called “Pacific Blob”) 2014-2016 would not have been record warm years. In terms of temperature 2015 was a record, beating 2014 by a narrow margin; Nasa Giss had it 0.13+/-0.1 °C, HadCrut4 was 0.18+/-0.1 °C and NOAA 0.16+/- 0.09 °C. When the three temperature datasets are considered 2015 was 0.16 °C above 2014. Even though the year is not over it seems clear that 2016 is going to beat 2015 and become the new record year. Preliminary estimates suggest that 2016 will be about 0.18 °C above 2015. But what was the El Nino’s contribution to 2015 and to 2016? There are a large range of estimates. Jeff Knight from the Met Office’s Hadley Centre, said their modelling set the additional heat from a big El Niño, like the current one, at about 0.2 °C. He said wind patterns in the northern hemisphere had added another 0.1 °C to recent monthly readings. On the other hand Adam Scaife suggested it was as low as a few hundredths of a degree, and Real Climate suggested 0.07 °C. Michael Mann told the Guardian that his estimate for the El Nino contribution to 2016 was less than 0.1 °C. Some estimates of the El Nino boost have been greater. When discussing the 1997-98 El Nino Hansen et al 2006 suggested it added 0.2 °C to global temperature. Foster and Rahmstorf (2011) suggest about 0.2 °C. 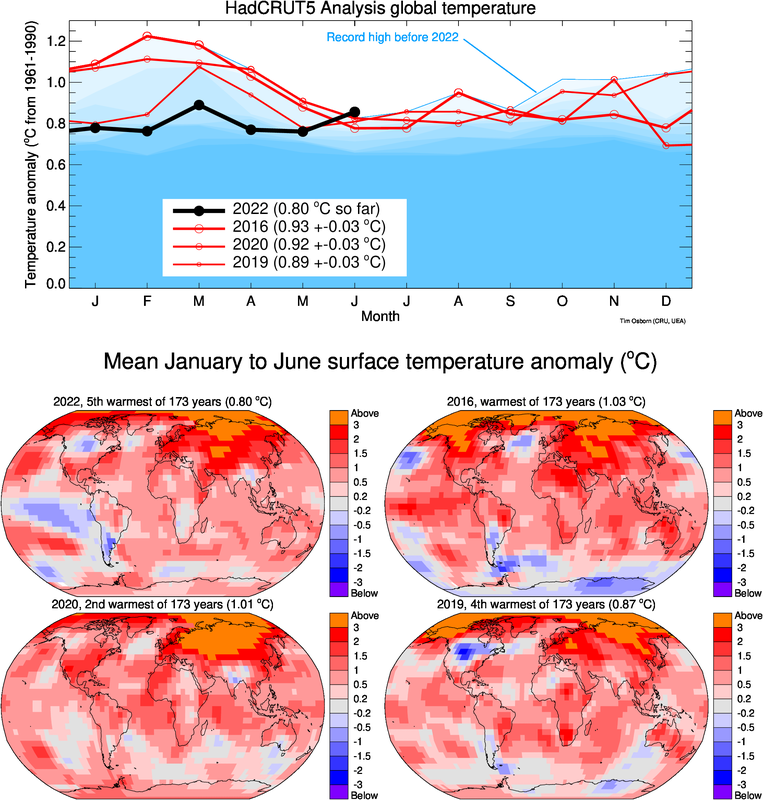 According to Sciafe the El Nino contribution to 2016 is expected to be greater than its effect on 2015, as its influence is generally greater in its second calendar year due to thermal inertia. He estimates a boost of about 0.2 °C. David Karoly from the University of Melbourne said that that after the El Nino has dissipated its effect on global air temperatures will persist for 3-6 months. Importantly he also said that after the El Nino has ended completely there will be no more temperature records. In other words, without the El Nino recent years would not have been record-breaking. If the record years are due to non-climatic variations one wonders why they are so often used to support climate models. Consider a comparison between CMIP5 and observations. It was clear that prior to 2015 the discrepancy between observations and models was stark. With the inclusion of 2015, and especially 2016 the impression is given that the discrepancy is decreasing! Do bear in mind however that the models do not include small volcanic effects and the recent dip in solar activity. But now comes a reality check: The El Nino has ended and the global temperatures are falling. Many think that 2017 will be cooler than previous years. Myles Allen of Oxford University says that by the time of the next big United Nations climate conference global temperatures are likely to be no warmer than the Paris COP in 2015. This would be a strange thing to happen if, as some climate scientists have claimed, recent years would have been a record even without the El Nino. For some the prospect of global cooling is a problem, especially for those who see the well-established change in the behaviour of global temperatures after around the turn of the century as an powerful “weapon” used by “sceptics” to cast doubt on climate science. But these sceptics were talking about real, emerging climate science in a way that was resisted by many of the more publicly visible scientists who had failed to adapt to the facts. The so-called “pause” – which is obvious prior to the recent El Nino – signaled a growing appreciation of decadal climatic variations. It provided an important step for understanding what was going on. Frankly, those individuals and organisations who a decade or so ago spoke of a clear and strong signal of global warming and imminent rapid temperature rise, have had to change their tune, and in some cases try to rewrite history by now saying they always knew what was going on.